We are dedicatedly involved in providing an excellent quality array of Votive Candles, for catering the various needs of our clients. Medium-size Pot Candles for Worship and Festive occasions. These Candles bring home the sweet smell of Gardenia. Its refreshing, revitalising and enlivens the atmosphere. Its petit and clear glass construction makes it a must have for your drawing room. Made of superior quality paraffin wax, these cut glass wax votives are available in bright colors like, red and blue, an ideal piece for adding brightness to the room décor apart from lighting. 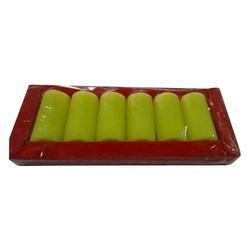 We are leading manufacturer & supplier of wax candles with aluminum votive. The same candles cames as a set of 3 pieces with a aluminum plate. We offer a quality range of Glass & Metal Votive & t-light holders. We are remarkable enterprise, involved in offering superior quality Table Decorative Glass Item. 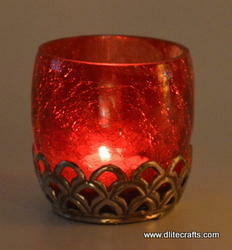 We are a significant organization in the market, engaged in offering a wide range of Glass Wax Votive Candle. We have carved a niche amongst the most trusted names in this business, engaged in trading and retailing a comprehensive range of Candle Votive to our clients. Offered Candle Votive is highly appreciated amongst clients for its aesthetic appeal and impeccable quality.